1. Keep the infected horse in a dry place with good ventilation and away from other horses and biting insects. 2. Work a microbial shampoo into a thick lather on the horse’s coat, let it sit for ten minutes, then rinse well. Follow with a conditioner suitable for rain rot in horses. Do this every day for a week. 3. 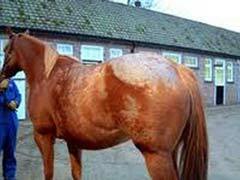 Moisten the horse’s coat to soften the scabs, then remove them very carefully. This can be a painful process for the horse, so handle this step delicately. Dry the horse thoroughly after scab removal. 4. Kill the underlying organism with any of a number of store-bought sprays , lotions, body washes, or gels. 5. Contact an equine veterinary professional for extreme cases. A vet will be able to prescribe antibiotics, if needed, and/or immune-boosting drugs to help your horse fight off the invading organisms. As you can see, rain rot in horses is fairly easy to detect and, once identified, can usually be treated by you, the horse owner, without the aid of a vet. Of course, if you’d like to avoid rain rot altogether, your best bet is to invest in an early preventative horse worming.